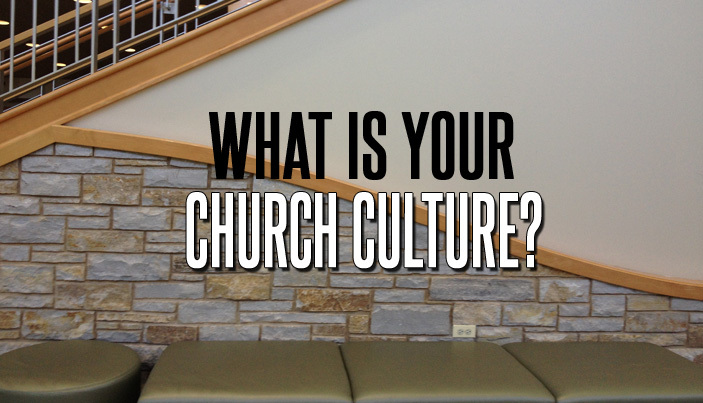 What Is Your Church Culture? Identifying church culture is a daunting task. We are filled with all sorts of preconceived notions about what a church should be, how comfortable we want to be and what we want to hear when we go to the church. There are probably more considerations than that, but we’ll go with these three for now. What is You Church Culture? • What is the location? rural? urban? suburban? • How well is the property cared for? • How involved are the people in the pew? • What kind of music to they hold dear or sacred? • How would you describe the mood of the church? somber? vibrant? relaxed? etc? • Are there creeds, rituals or doctrines that are sacred to the church? • What are the core values and beliefs? Obviously, there is much more to this idea of discovering your church culture, but these are good questions to think about and answer. They will help you understand what you would like to keep, what to tweak and what you need to change. *For more thoughts on evaluating your church’s culture, check out Look Before You Lead, by Aubrey Malphurs.